In association with Local First Arizona as part of National Independents’ Week, Modified Arts presents “Painted Skies,” a showcase of art based on the natural and manmade beauty of Arizona, created by Lisa Olson and Terry Pisel. Lisa Olson and Terry Pisel invite you to join them in celebrating the striking beauty of Arizona. From the sprawling spectacle of the Grand Canyon to the gridded streets of Phoenix, Arizona holds a dramatic and ever-changing variety of landscapes. Native Arizonans, photographers, friends, and collaborators, Olson and Pisel use their photographic skills to showcase some of the unique features of our state set against its biggest asset—the sky. 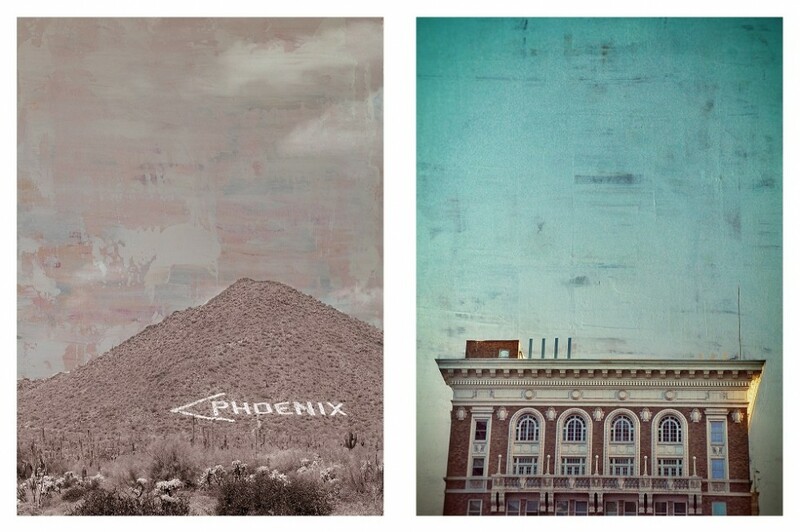 Using hand-transferred photographs altered using unconventional mediums, the artists portray a series of wide-ranging scenes: from cactus to pine tree, city to mountain, valley to mesa. Their wood panels feature interpretive regional landscapes giving homage to the forests, deserts and majesty of our home. Lisa Olson has been an active photographer for over ten years, graduating from Arizona State University with a BFA in photography in 2005, and spending three years as a photojournalist for the East Valley Tribune. Olson also is co-owner of the local-only boutique Practical Art in uptown Phoenix. Terry Pisel is a multidisciplinary artist based in Scottsdale, with work covering design, photography, painting, and architecture, often involving the manual transfer of images from one media to another. Pisel graduated from Arizona State University in 2012 with a Masters in architecture. Jake Early’s hand printed serigraphs have earned him much acclaim. A California native, Early moved to Tempe in 2007. Early illustrates and prints his serigraphs by hand on the printing press he designed and made himself. His simple illustrative style, bold color palette, and strong depiction of place all resonate with collectors. Early’s love of posters as a traditional form of public communication provide the perfect canvas for his work. National Independents’ Week is an annual, weeklong celebration of local, independent businesses, coinciding with the week of Independence Day. Locally, Local First Arizona heads these celebrations with its “Golden Coupon” for discounts, and dozens of independent and cooperative events across the state.